Well, despite our lack of base boards, or a finished kitchen, or curtains in the bedrooms or any other unfinished to-be-done items in our house, I managed to spread a little Christmas cheer here at Preservation Acres. I really hadn’t anticipated on putting out as much as I have (which somewhat-embarrassingly is not even all of it,) because I really didn’t think we would be able to unearth any of the bins from our storage unit. But while we were looking for our coffee table and dressers, I stumbled upon several bins, including our tree ornaments and stockings. Hurrah! And there is a random shepherd hanging out by my thrift store log lamp, slowly making his way towards the manger. I am 100% copying The Farm Chicks with this little grouping. Miles added the Santa for me. I need some animals for my barn, but for now the snowmen are keeping watch for now. 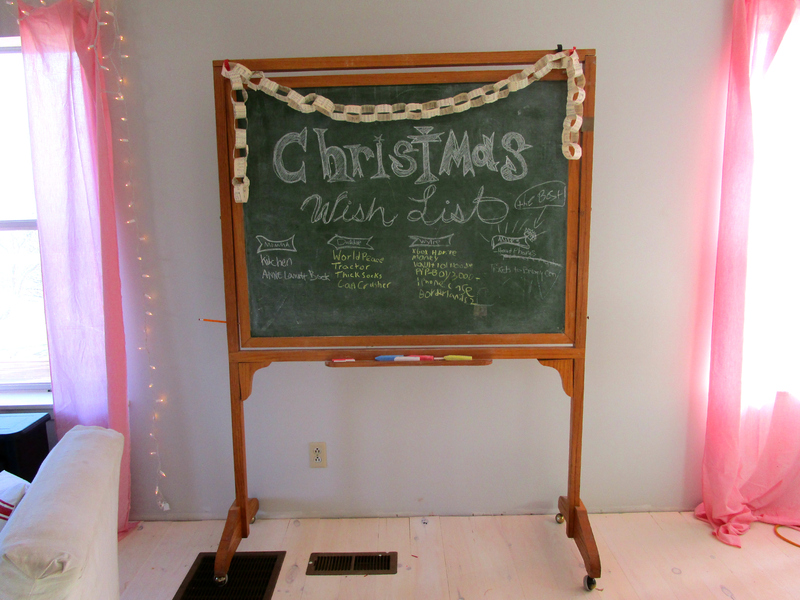 Originally I was going to try and write something really deep and meaningful on the BEST chalkboard of all time, until I realized that what I really needed was a way to keep track of everyone’s wishlist for the year, now that we are past writing Santa letters. So I (again) attempted some hand lettering and asked everyone to write down a few items that they would enjoy finding under the tree. I felt a little pang of “what will people think about this display of blantant wish for material things?” and then I realized that showing this list is being honest. 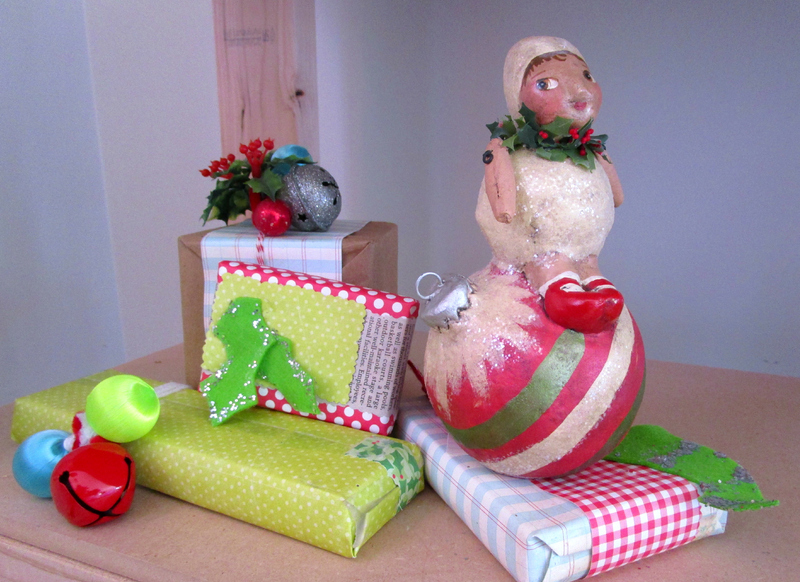 While we don’t go hog wild, we do love to give and get gifts at Christmas, big and small, store bought and handmade, and pretending that we don’t would just be a big fat lie. Several of the bins we uncovered were a complete mish-mash of odds and ends. Last year we only got a small handful of bins down, and the year before I had a broken foot, so there were a lot of random items thrown in together. These faux-gifts are leftovers from the photo shoot from my book, and this little figure is a favorite from a holiday show years ago. I just think she is the sweetest thing. 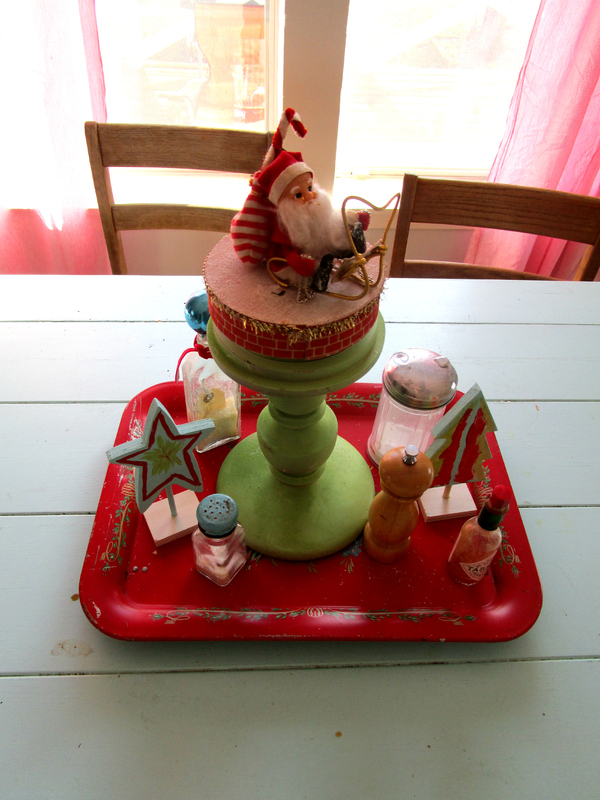 Everyone needs a few decorations to go with their salt shaker and Tabasco sauce, right? The wooden tree and star are from a painting project I did with the kids last year, and the tray is a recent flea market find. This is a vintage music box from my Nana’s house. 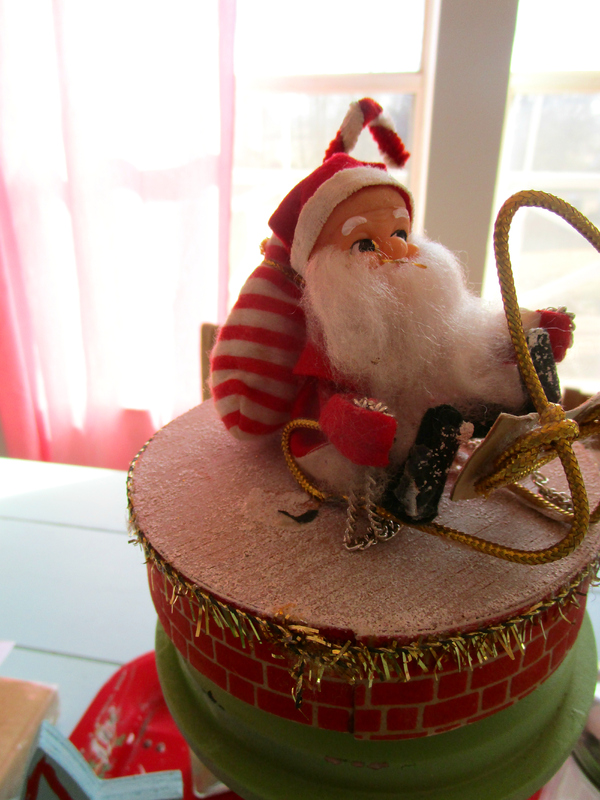 Before the estate sale I managed to grab several vintage Christmas ornaments/odds and ends like this. This piece in particular has seen a lot of wear and tear over the years, and the music plays so slow now that it took us a good few minutes to be able to pick out the tune – Jingle Bells – but I love having this little piece of my childhood on my table, reminding me of all the magical Christmas Eve’s spent at my Nana and Grandaddy’s house as a little kid. This house does not have a mantle, which I didn’t mind until it came time to hang the stockings. So I had to get creative. This is the wooden frame from a twin box springs. I found it on the side of the road and dragged it home,a couple of years ago. I have hung all sorts of things on it, but this is by far my favorite application to date. This just proves that one mans trash REALLY is another (wo)mans treasure. 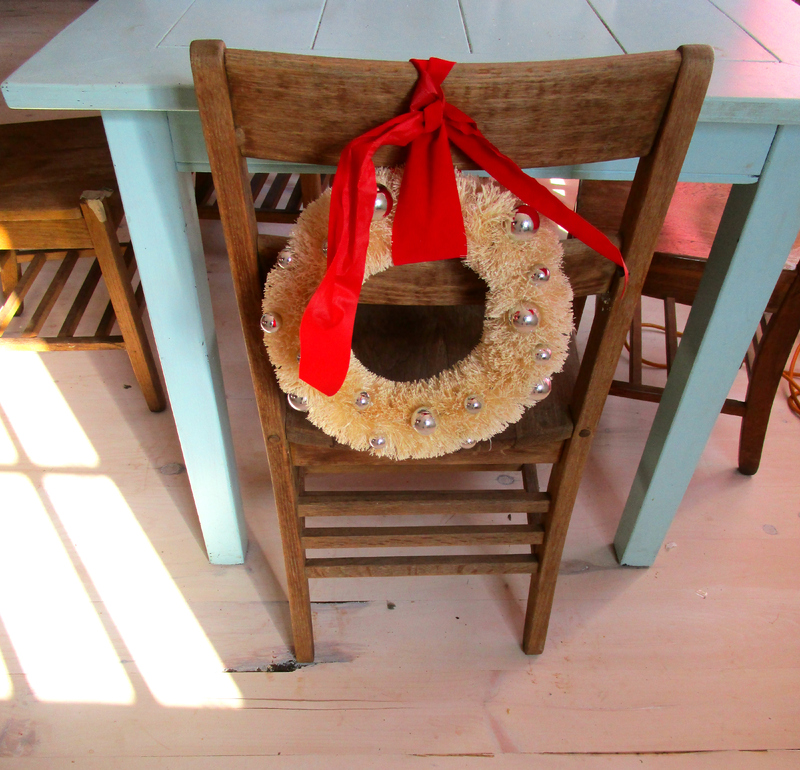 These bottle brush wreaths (I have 2) are some of my all time favorite finds but I couldn’t find the right wall or windows to hang them in, so I hung them on the back of the chairs at each end of the table on a whim, and there they have stayed. Which I kinda really love. Over the years I have begun to collect stuffed animals and softies that we only bring out at Christmas. These are the ones we bought last year on our big vacation, when K was still living with us. I sure love and miss that girl. 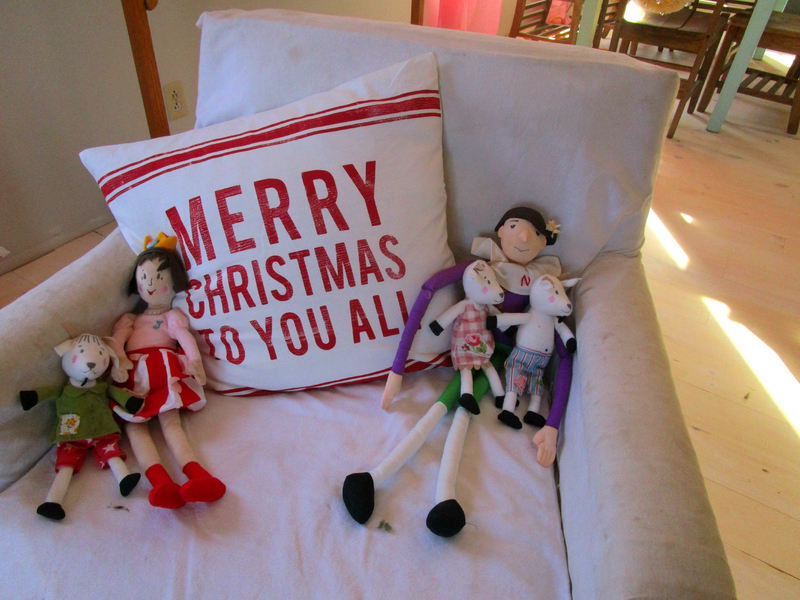 The pillow cover is new and is from H & M.
So there you have it – a little imperfect, beautifmess, homespun holiday from our home, from our first Advent and Christmas here at Preservation Acres. 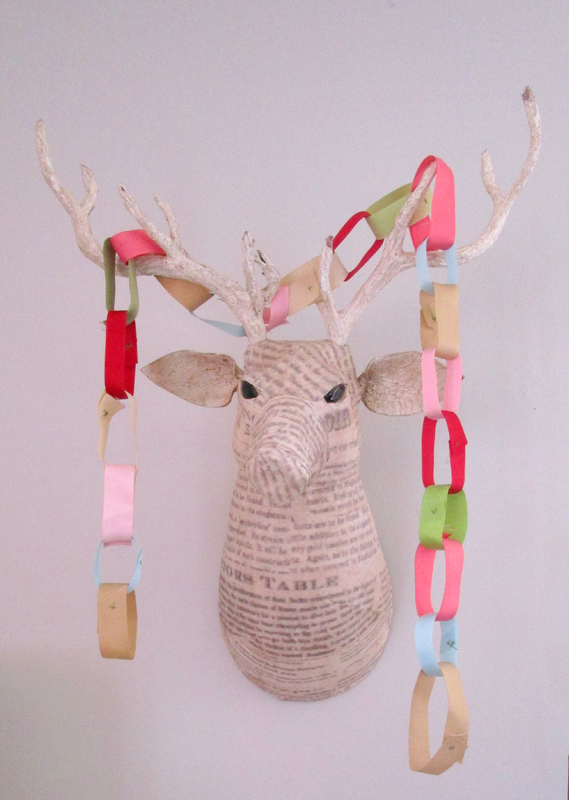 I love your homespun decorations. As for the wish lists, we all have things we wish for. You just can’t leave that off in household of growing kids. 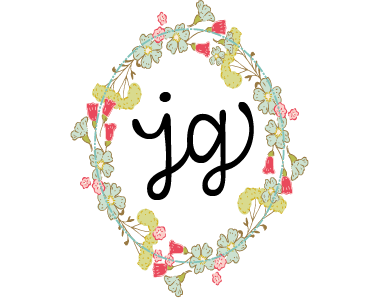 I’m looking forward to having you speak to our Little Rock writers’ group on Tuesday! Looks so festive! 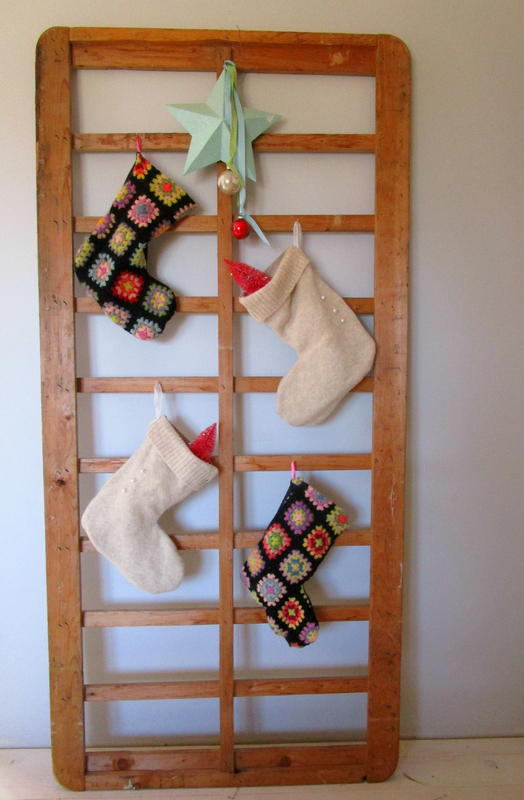 I love the granny square stockings – they remind me of my grandmother who made EVERYTHING out of granny squares!! Enjoy the holiday season in your new home! I wonder if it would help to oil the music box? 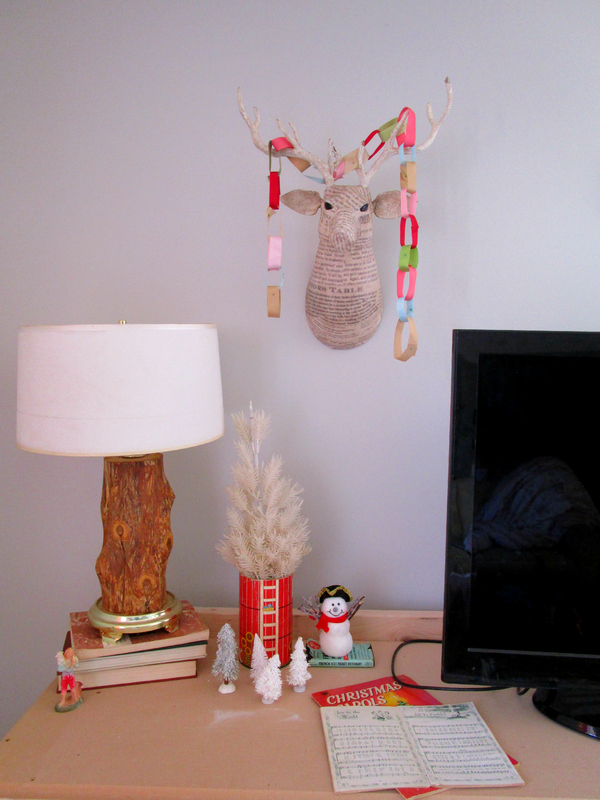 I think you should make a faux mantel! A beautiful, festive, happy Christmas at your house Jerusalem! Love it all!